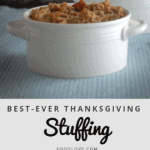 Are you a stuffing lover or a stuffing hater? 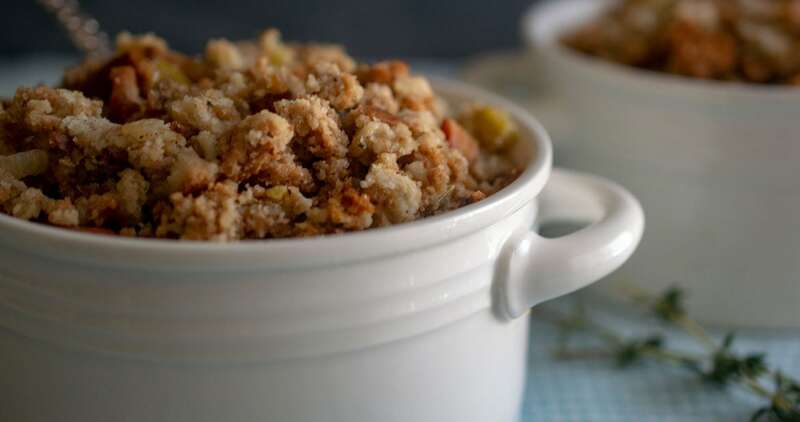 Stuffing is probably the #1 favorite Thanksgiving side dish, but not if it’s bland or mushy. A good stuffing recipe delivers a balanced combination of flavors and textures. 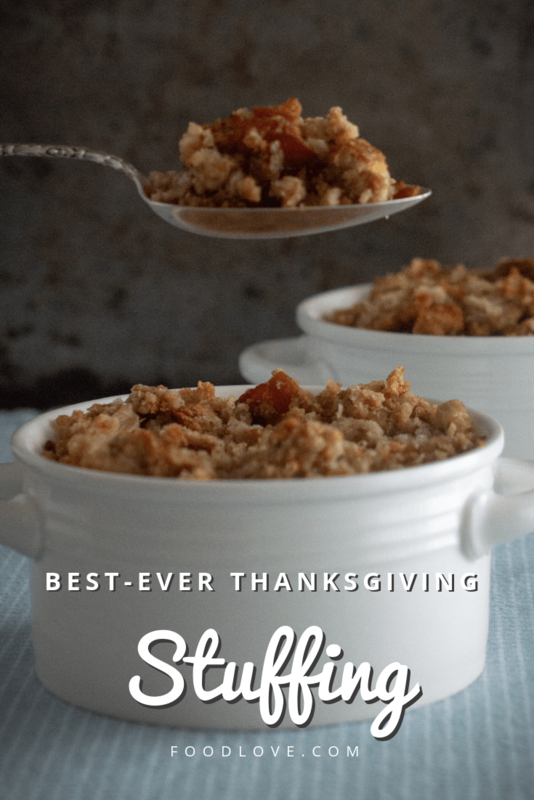 I’ve been perfecting my recipe for Thanksgiving stuffing for years, and I think it’s just right. 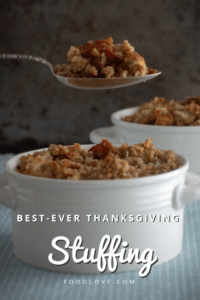 This best-ever Thanksgiving stuffing recipe is a blend of savory and sweet, with just a touch of bacon, because bacon makes everything better! Your stuffing making process will be easier if you prep all the ingredients ahead of time. Have all the ingredients and tools assembled before you start, so the recipe comes together quickly. Dice one cup of onion and one cup of celery. Cut 1/2 pound of sliced bacon crosswise into little sticks about 1/3 inch wide. Cook and stir the bacon in a large skillet over medium high heat until the pieces are starting to get crispy. Turn off the heat, and move the bacon to a small plate using a slotted spoon. Pour the bacon fat from the skillet into a heat-proof measuring cup. Return four tablespoons of bacon fat to the skillet. Add the celery, onion and butter. Cook and stir over medium high heat for three minutes. Add the garlic. Cook and stir for three more minutes until the celery and onion are translucent and starting to soften. Remove from heat. 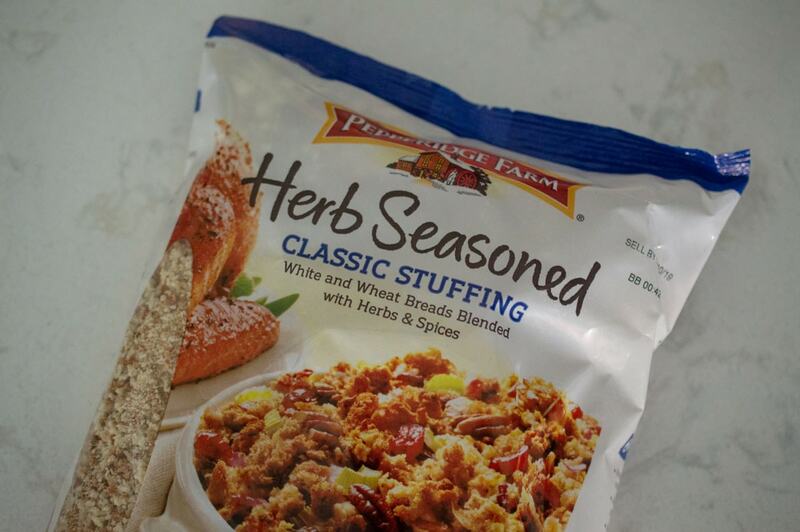 This recipe calls for a 14-ounce package of traditional or herb seasoned stuffing mix. I like Pepperidge Farm Classic Herb Seasoned stuffing mix, because it has a mix of white and wheat bread. If you have another favorite stuffing mix, use that instead. Blend all the stuffing ingredients together in a large mixing bowl. Taste to find out if the seasonings need to be adjusted. I like a lot of black pepper in stuffing, so I might add more than the recipe calls for. The stuffing mix is already seasoned, but I like to add a little extra seasoning, using either dried sage or poultry seasoning. My absolute favorite is Rudy’s Turkey Rub, which I have shipped from Texas, but any poultry seasoning will work fine. This stuffing is moist but not wet. If you like a wetter stuffing, add 1/2 cup to 1 cup more liquid (a mix of apple juice and broth). If you have homemade chicken or turkey broth, that is absolutely the best, but canned or reconstituted broth is also good. When it comes to Thanksgiving stuffing, people debate about whether to cook it inside or outside the turkey. If the stuffing is cooked outside the turkey, it’s technically not stuffing, it’s dressing. There’s no need to get hung up on terminology, though. It’s going to be tasty no matter what you call it! I cook my stuffing outside the turkey, because in my experience a stuffed turkey takes longer and is harder to cook. It’s already challenging to roast a turkey and get both the light and dark meat to the right temperature. Stuffing makes it even more challenging. Our favorite way to cook a Thanksgiving turkey is using an electric turkey roaster. 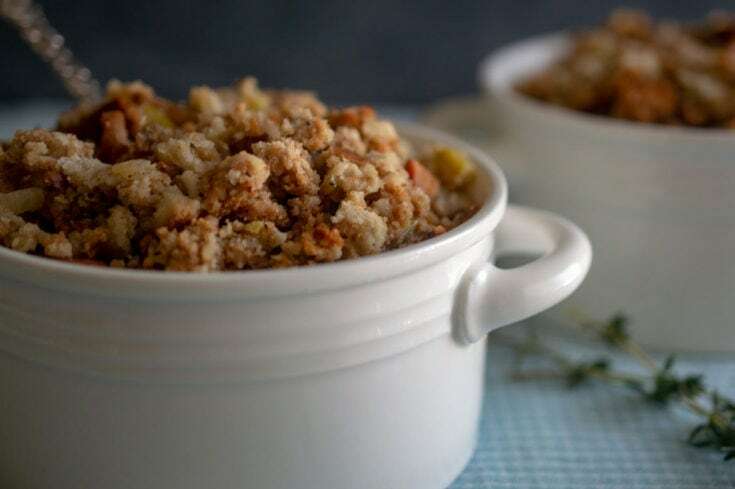 To cook your Thanksgiving stuffing outside the bird, put the stuffing mixture in a medium casserole dish, preferably one that has a lid. Bake, covered, at 350 degrees for 25 minutes. Uncover and bake another 10 minutes. By this time your stuffing will be cooked through and toasty on top. Isn’t it gorgeous? This Thanksgiving stuffing is absolute perfection – savory and smoky, with a touch of sweetness. 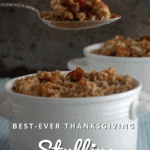 This Thanksgiving stuffing is absolute perfection - savory and smoky, with a touch of sweetness. 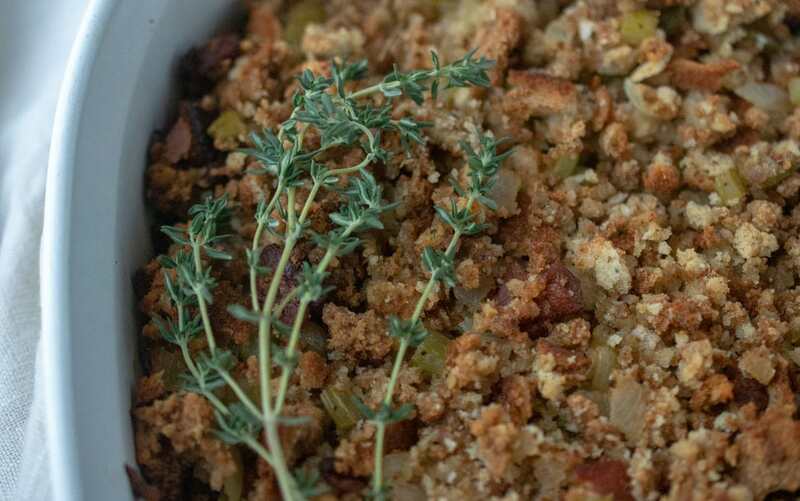 Elevate plain stuffing with bacon and apple for a balanced combination of flavors and textures. Place bacon in a large, deep skillet. Cook over medium high heat about 5 minutes until crisp, stirring to prevent burning. Remove bacon from heat. Remove bacon pieces from skillet using a slotted spoon. Set aside. Pour the bacon fat from the skillet into a heat-proof small bowl or measuring cup. Wipe out the skillet with a paper towel. Return 4 tablespoons bacon fat to the skillet. Add the butter, celery and onion. Cook and stir over medium high heat about 3 minutes. Add the garlic. Cook and stir 3 more minutes, until the vegetables are translucent and beginning to soften. Remove vegetable mixture from heat. 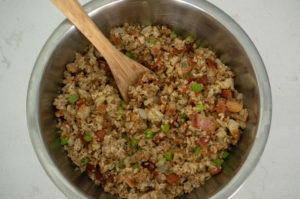 In a large mixing bowl, combine the stuffing mix, sage or poultry seasoning, vegetable mixture, bacon pieces, apple juice, chicken broth, and black pepper. Transfer mixture to medium buttered baking dish. Bake covered in preheated oven 25 minutes; uncover and bake an additional 10 minutes until the top is lightly browned.